If you still don't have a Nintendo Switch - you poor, poor soul - now is the time to invest. Get two of the best games on the system and the console itself for just £299.99, a saving of an impressive £63.44. It's technically a pre-order, but the bundle will ship on November 16, so you won't have to wait long at all. Each bundle comes with the Switch and Just Dance 2019, so you just have to choose between Pokemon: Let's Go Pikachu, Pokemon: Let's Go Eevee, or Mario Kart Deluxe 8 as your second game. 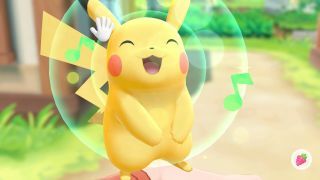 Our reviewer called Pokemon Let's Go "a superb surprise, a fully-fledged Pokemon RPG with interactivity that brings the series to life in a way that's never been done before," so it's one you're going to want to grab in time for those long train journey's back to mum's house for Christmas. For more great prices in November, stay tuned to our Black Friday game deals guide. And if you're looking for specific Nintendo offers, check out our Black Friday Nintendo deals page.